Rosenfeld Injury Lawyers LLC represents people with broken bones injuries suffered in accidents such as motor vehicle collisions, work-related accidents and other types of professional negligence. Our law firm has collected a series of bone fracture accident FAQs related to the medical and legal aspects of an accident involving broken bones. Should you have additional questions, we invite you to contact our office for a free review of your legal rights. The Broken Bone Injury Attorneys at Rosenfeld Injury Lawyers have represented many clients who have sustained serious bone fracture injuries caused by the negligent or reckless actions of others. Our legal team has compiled a list of the most frequently asked questions concerning broken bones and fractures and provided answers below. How Long Does it Take to Heal From a Fracture? That depends on the severity of the fracture in the level of care you receive. Typically, the healing process can take anywhere from a month to several months. The range of the healing process varies because everyone's body heals at a different rate. Your healing process could take less or more time. How Will the Doctor Treat my Fracture? Typically, the doctor will diagnose the type of fracture or bone break you have and create a plan of action to set the bone and stabilize it in place during the healing process. You might need to wear a fiberglass or plaster cast to ensure that your bones remain set in the same position until the healing is complete. Based on your type of injury, a surgeon may insert screws into the upper and lower portion of your undamaged bone to ensure that the broken or fractured area remains in place. The surgical procedure might require the attachment of plates bolted on the bone's outer surfaces. The location, type of fracture, and the severity of the break will determine treatment in your case. How do I Know if my Child Broke Their Bone or Dislocated a Joint? Without the proper diagnostic tools and education, you will not be able to tell exactly what happened to your child's bones. Both a dislocated joint and a fracture are considered severe injuries that require immediate medical attention. The doctor may capture an image of your child's bones through an x-ray or another device to determine if the bone is chipped, cracked, broken or fractured. If your child fractured their bone, it could have pierced the skin through an open fracture. These injuries required emergent care to minimize bleeding and reduce the potential risk of developing a life-threatening infection. A dislocated joint will still require a proven procedure handled by a train professional to ensure that the joint returns to its normal location. How Many Diverse Types of Bone Breaks and Fractures are There? Complete Fracture – This type of fracture usually breaks the bone in at least two pieces. Complete fractures are typically the result of serious car crashes or slip and fall events on hard surfaces. Open Fracture – This type of break produces a broken bone that pierces through the skin and causes mild to severe bleeding. Single Fracture – The bone breaks at a single location. Greenstick Fracture – The bone cracked on just one side and not through to the other side of the bone. Greenstick fractures typically occur from specific accidents including falling down stairs. Comminuted Fracture – Bones that break into three pieces or more, or are crushed. Bowing Fracture – These types of fractures occur only in children when the soft bone bends but will not completely break. I Think I Broke my Toe. How Will I Know for Sure? Broken toe bones share identical symptoms to straining, spraining or stubbing the toe. Because of that, it is often difficult to diagnose. Typically, you will experience intense pain that does not seem to diminish in intensity after a day or two. A broken toe may have a swollen appearance or have bruising and discoloration. It is recommended to seek medical advice to ensure that a broken toe properly heals if it points in the wrong direction or looks oddly out of shape. The Doctor Says I Have an Avulsion Fracture. What is That? Avulsion fractures can be complex and difficult to heal. In addition to breaking the bone, there is also additional damage at the point where the ligament or tenant attaches to the bone. While avulsion fractures can happen at any location, they usually occur in specific spots. Usually, the break is the result of a sudden forceful blow on a ligament or tendon at the same time the bone moves in the opposing direction. Typically, an avulsion broken bone injury can be difficult to identify in an x-ray because it is usually only a tiny piece of bone that has ripped away from its normal location. My Bone Aches but There are no Obvious Signs of a Break. What do I do? Even though there are no obvious signs of a break, the bone could be broken. Look for “not so obvious” signs and symptoms of pain at the site, swelling, redness, and the need to avoid movement in the affected area. Seeking the diagnostic advice of a medical doctor is a wise decision. Before visiting the local emergency room, wrap the affected area with the bag of ice or ice pack and keep the ice in place at the painful site for a few minutes, taking it on and off. If the bone seems out of place or deformed, get to the emergency room now. The Doctor Says I Have the Skull Fracture. Is This Serious? Yes, skull fractures can be extremely serious. If you hit your head hard enough against any object, structure or surface, you can easily develop a skull fracture that could lead to a potential traumatic brain injury. Fractured skulls are often life-threatening especially if there is a depressed area of broken skull bone that presses on the brain. Some injuries require immediate medical attention if the skull has shattered into fragments or pieces where the bone must be carefully removed to alleviate any pressure on brain matter. The doctor will likely need to perform delicate surgery for bone fragments embedded in brain tissue. A basilar skull fracture that occurs at the base of the skull can cause extensive nerve damage that affects both the cranial and facial nerves. Someone Else's Negligence Caused my Broken Bone. Can I Sue for Compensation? Most likely. If another's negligence caused your broken bone, you are likely entitled to receive financial compensation to recover your monetary damages, lost wages, medical expenses and noneconomic damages including pain, suffering, emotional distress and anxiety. The Bone Injury Attorneys at Rosenfeld Injury Lawyers handle complex personal injury cases to ensure that our clients receive the monetary compensation they deserve. The value of your case depends on the severity of your injuries and the extent of your damages. Our law firm can review your case to determine the worth of your claim if filed against every potential party responsible for your damages. The lawyer will calculate the value of the case based on the circumstances surrounding the accident, the need for future medical care and how your severe injuries have altered your Activities of Daily Living. Can I Handle my Case Without Retaining an Attorney? Certainly. However, tort law surrounding the civil justice system can be extremely complex. Also, you will need to follow the rules of civil procedure to ensure that all necessary documents and paperwork are filed in the appropriate courthouse at the proper time. How can an Attorney Help me Resolve my Case? An attorney working on your behalf will review your claim for compensation, investigate the facts, gather evidence, speak to eyewitnesses, and develop a case to ensure you and your family receive the monetary recovery you deserve. Your lawyer will handle every aspect of the case. The law firm will file all documents, identify the defendants in the case, depose witnesses, review your medical records, and negotiate with the defendant's attorneys to settle the case or present the evidence during a jury trial when necessary. How Will an Attorney Identify the Defendants in my Case? Your lawyer will review all the circumstances surrounding your injury to identify potential defendants involved in your case. A defendant could include a landlord who negligently forgot to repair a broken stairwell, a supermarket that neglected to clear away ice and snow outside the store entrance, a motorist who failed to obey traffic laws that caused the accident or others that were directly or indirectly responsible for your damages. Can I Wait to File my Lawsuit or Compensation Claim? Probably not, the state statute of limitations law restricts the amount of time you must file a claim before you give up all legal rights to ever seeking financial compensation at any time in the future. However, there are various statutes of limitation based on circumstances. Your attorney can help you identify the amount of time you have left before you give up your rights to seek monetary recovery. Additionally, if you wait too long, any evidence to prove your case could disappear, the eyewitnesses could move away, everyone's memories could diminish, and the ability to prove your case to a claims adjuster or a jury could become much harder. Your lawyer needs to get started right away to determine the extent of your injuries, the length of your recovery process, the permanency of your disability and the extent of hospitalization and medical bills you will generate in the future when you receive needed treatment. 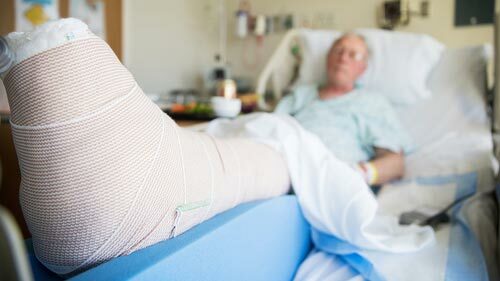 If you believe your bone fracture injury is the result of another's negligence or intentional action, you likely have the legal right to seek financial compensation. The broken bone injury attorneys at Rosenfeld Injury Lawyers can assist you in filing and resolving a claim for monetary recovery against every defendant at fault for your harm. We provide every client an initial, no-obligation consultation at no charge. Contact our law office today at (888) 424-5757 to schedule an appointment to discuss the merits of your case. Our legal team accepts all personal injury cases, wrongful death lawsuits, and bone fracture injury claims for compensation through contingency fee agreements. This arrangement postpones payment of your legal services until after we have successfully resolved your case at trial or through a negotiated settlement. Let us begin your case today to alleviate the financial burden on you and your family. All information you share with our law office remains confidential. Do I Have a Broken Bone Claim? How can Rosenfeld Injury Lawyers LLC Protect my Broken Bone Claim? How do Bones Break and What are the Most Common Forms of Broken Bones? How do You Treat Broken Bones? How Long do I Have to File a Personal Injury Lawsuit Involving a Fractured Bone Under Illinois Law? What are the Facts About Broken Bones? What can I Recover for my Broken Bone Claim? What Have Other Broken Bone Plaintiffs Recovered? What Laws Govern Broken Bone Claims in Illinois? What are the Most Common Types of Orthopedic Surgery? Why do I Need a CT Scan if I’ve Had an X Ray? How Will an MRI Impact my Injury Case? How are Burn Injuries Categorized? What are the Most Common Orthopedic Surgeries?